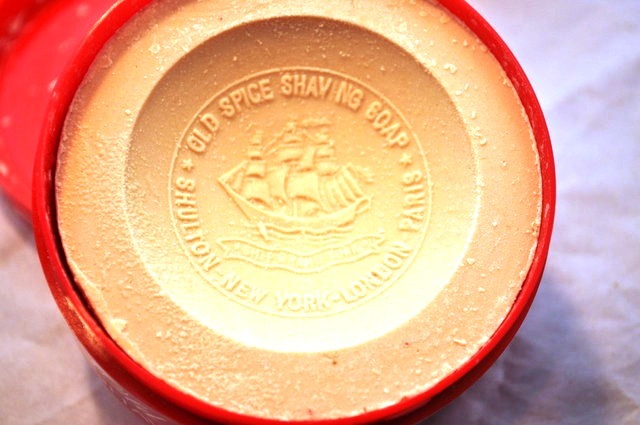 To accompany its line of men's toiletries, Shulton produced a variety of shaving soaps and lathers, first in the form of soap cakes for the shaving mugs (more Mug Detail), tube based creamy products, shaving sticks and ultimately aerosol cans. 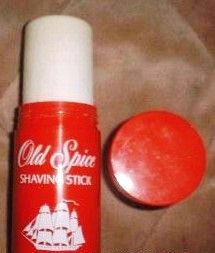 Additionally, shaving accessories were available from time to in gift sets of Old Spice products. 1938 to mid 1940s - 5.5 oz. mid 1940s to 1959 - 5 oz. 1960 to 1964 - 4 oz. 1965 to 1975 - 3.75 oz. 1976 to 1991 - 3 oz. Originally the package was a large red cardboard cylinder with a lid. Inside was a cylinder of soap that fit in the mug. In 1960 the package changed to a square box with the a ship silhouette (white sails, black hull). Note that in 1973 the row of stars around the top edge were dropped. 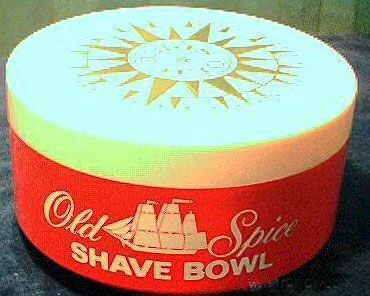 By the 1970s, the soap was a 3 oz. disk about 3/4 inch thick. The 1981 image shows the blue banner style. 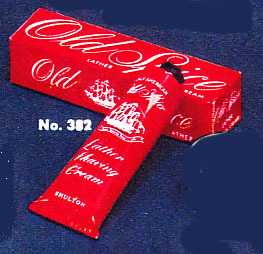 In the early 1940s Shulton introduced two tube-based shaving "soap" products: Lather Shaving Cream in a red tube (product id 382) and Brushless Shaving Cream in a blue tube (product id 383). Each tube contained 4.5 oz. 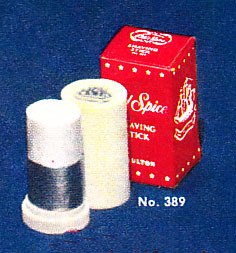 In 1962 the product id changed to 3820 and 3830. 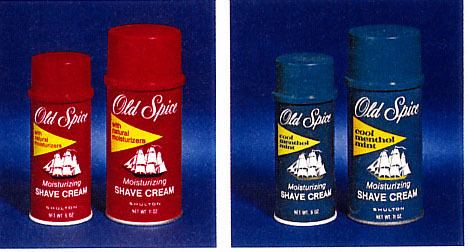 Note the subtle distinctions that distinguish these very similar products: "Old Spice" is red or blue in 1961 and the boxes are either solid red or red and white. These products were sold separately in individual boxes and were included in many gift sets. Sales ceased around 1975. 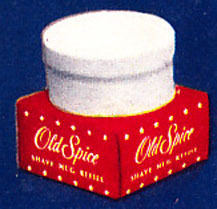 Shave sticks were introduced in the early 1940s and sold in the US until 1956 (product id 389). It was a softened soap stick that could be rubbed over the wet face to produce a lather. Its packaging originally was atypically plain. It came in a white plastic tube with almost no markings. Black and white image at left is from a 1950 Old Spice sales catalog. By 1955 the stick was placed in the more traditional box. The image at right is of a shave stick sold in England around 1960s to 1970s. 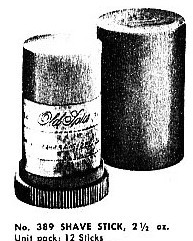 The pressurized shave cream can was first introduced in 1953 (product id 369) in a 6 oz. can touting a unique locking cap to avoid spills when traveling. From 1955 to 1962 the volume was 6.25 oz. In 1958 the can graphics and top changed. 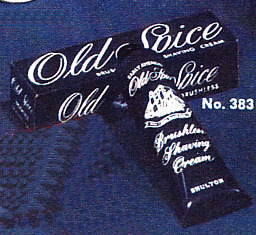 At this time the first mentholated shave cream hit the market (product id 369P). 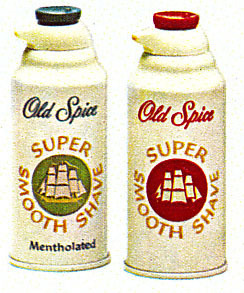 In 1961, the product name changed to Super Smooth Shave and the graphics changed accordingly. In 1962 the product ids changed: Regular became 3690 and Mentholated became 3680. In 1965 an 11 oz. economy size for each flavor was introduced: Regular product id 3691 and Mentholated product id 3681. 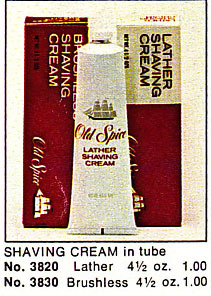 In 1973 the can style changed completely, and in 1975 the product name was again changed to "Moisturizing Shave Cream." 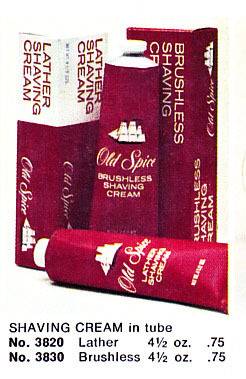 In the 1980s the product was called Moisturizing Super Rich Shave Cream. 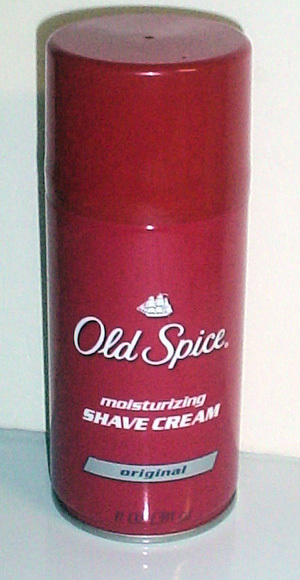 A more recent example of moisturizing shave cream made for the Canadian market. Lime scented shave cream in an 11 oz. 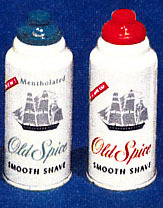 aerosol can was first introduced in 1966 as Lime Homogenized Shave Cream (product id 3590). 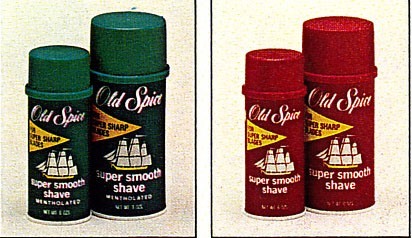 In 1973 the name changed to Lime Shave Cream and sported the new can design. In 1977, as with al Lime Products, it was rebranded Fresh Lime Moisturizing Shave Cream. There was also a Manpower Lime Shave Cream shown below. 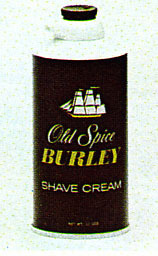 Burley Shave Cream was sold in an 11 oz. 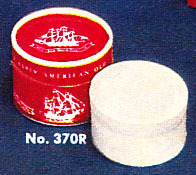 can from 1967 until 1975 (product id 3155). It also appeared in a 6oz. can as part of two Burley gift sets in the early 1970s. At right is a small "sample size." 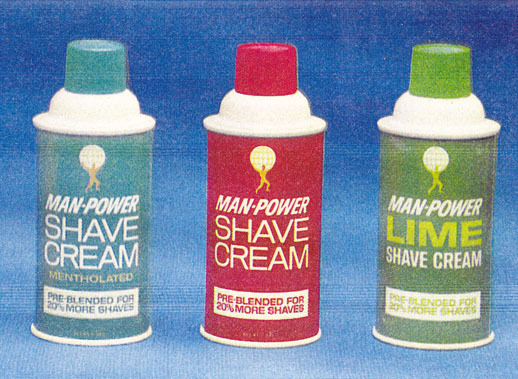 Under the "Man-Power" logo, Shulton produced three flavors of shave cream from 1966 to 1970, all in 11 oz. cans. 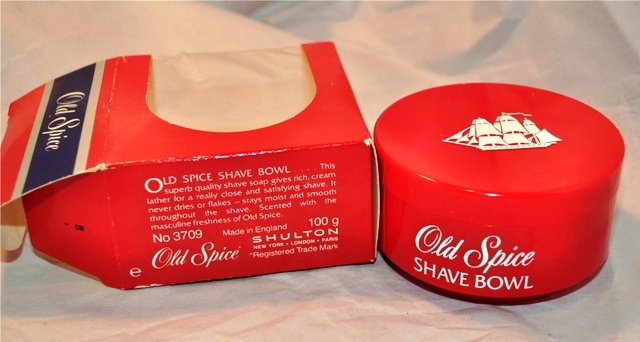 1976 - 1981 Musk for Men Sensual Shave Cream was sold from 1976 to 1981 (product id 3459).